The title of this post sounds like a new bistro sandwich LOL! 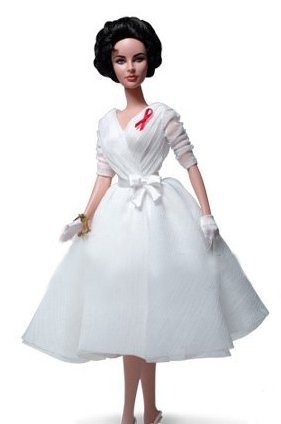 The earlier gowns of the BFMC Barbie line are the favorites of many. 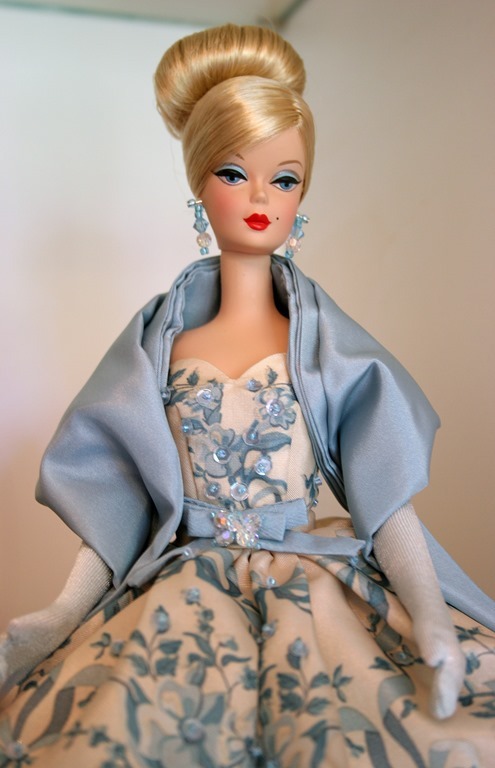 This gown from a Barbie called “Provencale” with it’s delicate blue and white pattern was originally worn by a short haired redhead. I have never warmed to that particular doll in that dress. 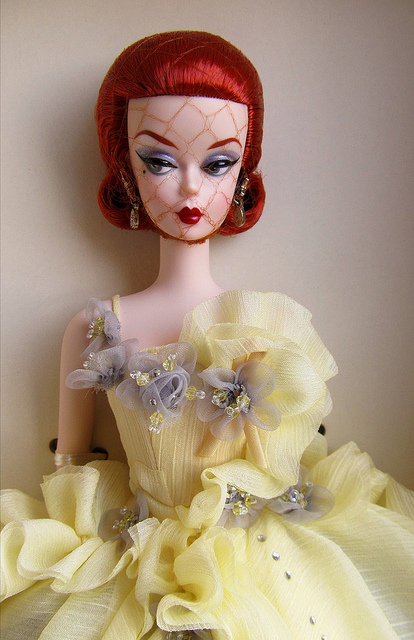 I love the dress and I love the doll…just not together. 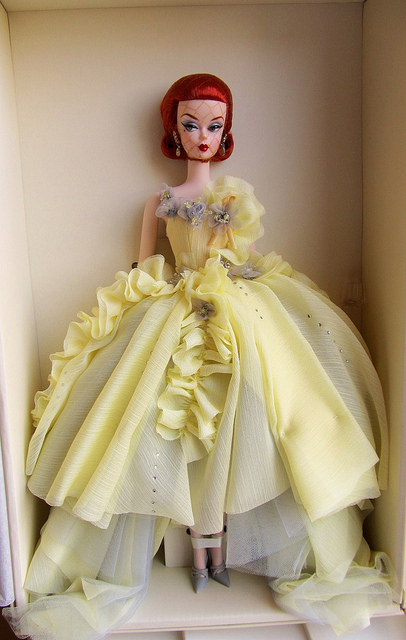 This dress, since it entered my collection, has graced the form of French Maid Barbie. 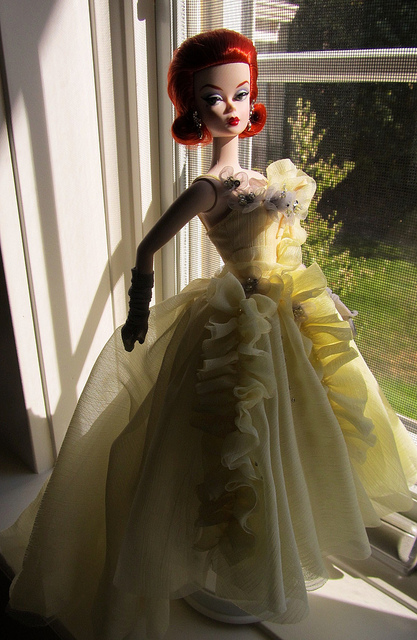 For a time last week, this gown was beautifully worn by the newly released red haired Poppy Parker. Hope you like the photos. And just in case you needed even more drama in these photos…. It has been a while since I did a Bogue’s Vogues Vendredi so I thought I would pull this one out. I keep some photos that I take in reserve for special projects. 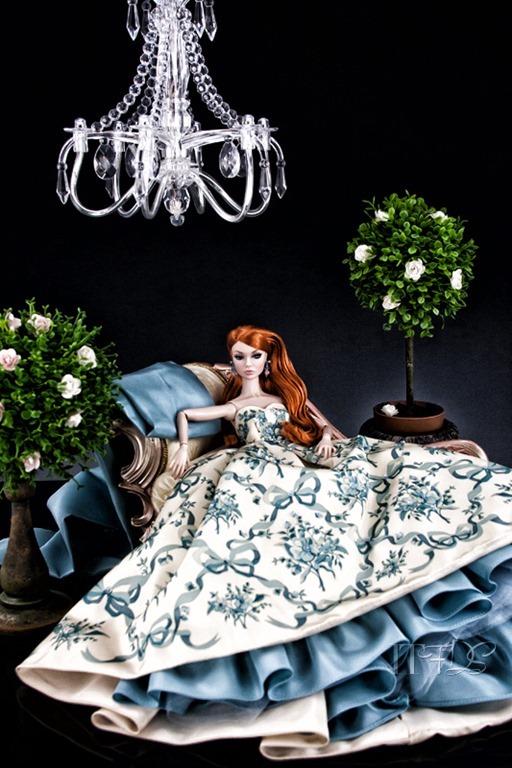 I took this photo a while ago and it was included in the Inside the Fashion Doll Studio Daily Planner for 2013 that I sold at Barbie Convention this year. Since we are enjoying the fabulous days and colors of the Autumn season, I thought I would share this fall inspired set of photos. Hope you enjoy! 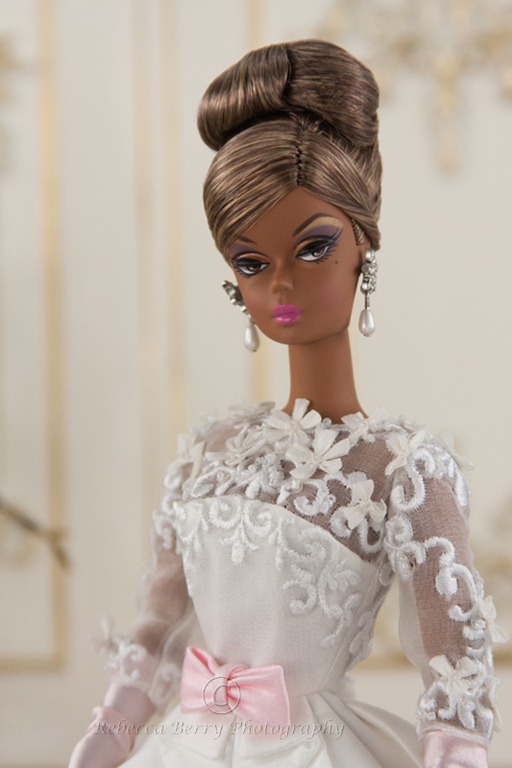 Gala Gown Silkstone Barbie: No more than 6500 worldwide. 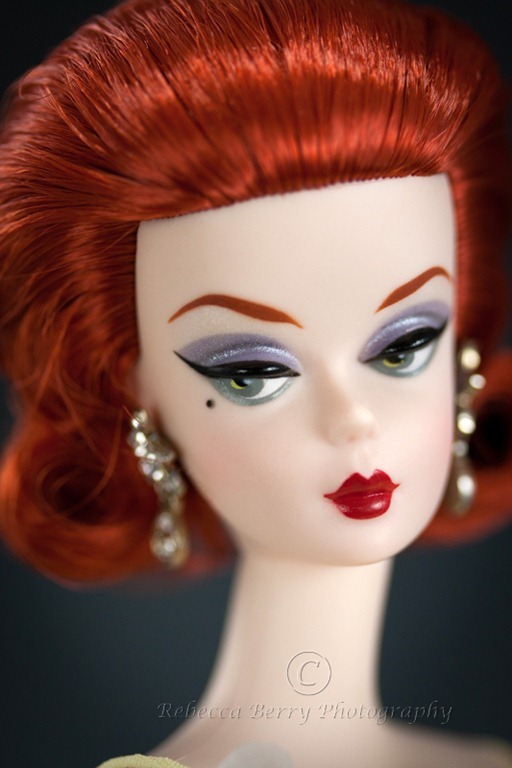 She retails for a whopping $150.00….and I paid it with gladness in my heart because I LOVE THIS DOLL. 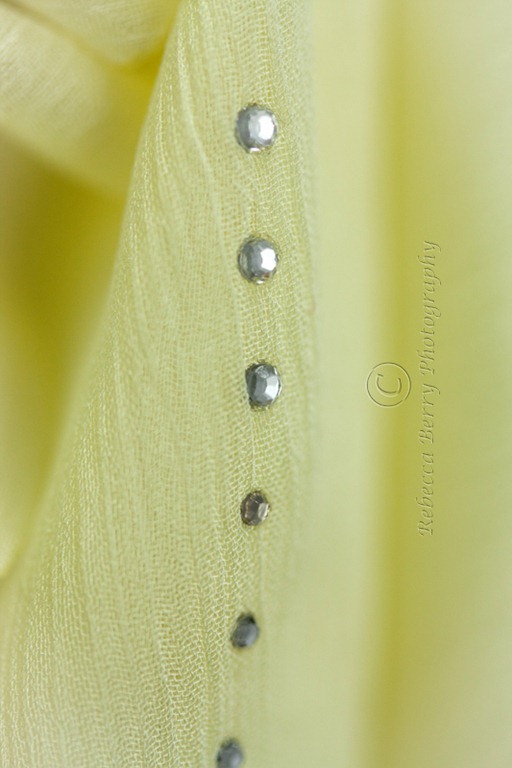 The detail on the gown ( as you will see in the detail shots) are fabulous. 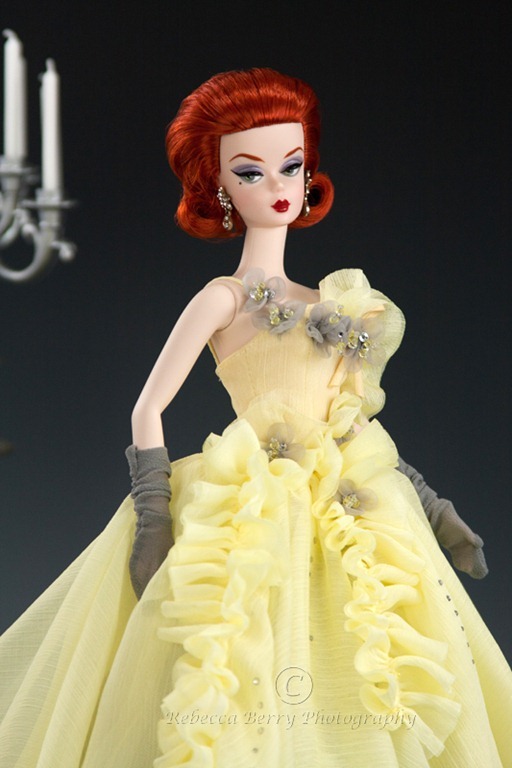 The gown is a soft butter yellow and is so frothy every ‘girly’ tendency you have in your body will stand up and cheer. Her hair is a deep red like the platinum ‘Joyeux’ or ‘The Siren’. Her skin tone is pale like CC Debut. The outfit is completed with a pair of silver star rhinestone studded drop earrings , grey chiffon ruched gloves and soft grey strappy slingbacks. 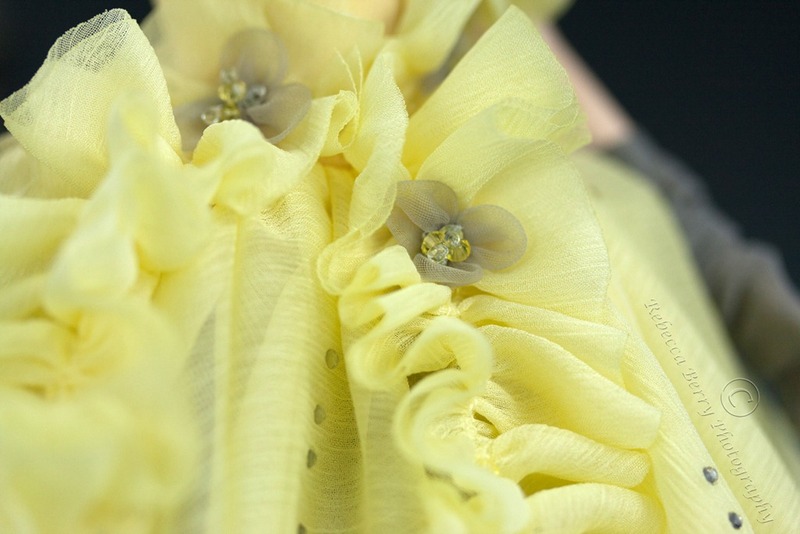 There is a hint of grey tulle under the butter yellow gown so it is full and flowing. 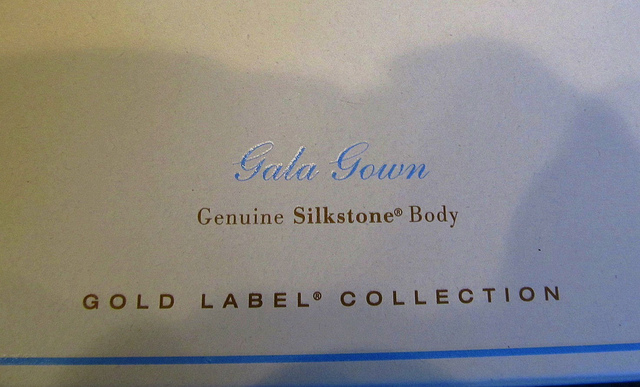 The fabric on the gown is incredibly soft…LOVE! The hair is set but not crusty clumped and caked. This is good because the hair is soft…the bad part is the hair can be messed up easily so take care with it. And….Rebecca having fun with her macro lens AGAIN. And some fun with photoshop and Mattel’s promo shot. I think she is even better than Mattel’s promo shot and that just doesn’t happen that often. Please don’t reproduce this photo as It’s Mattel’s image on another background. Run don’t walk for this one! A word of caution when deboxing this lady….the hairstyle is set but moves easily ( doesn’t have hard caked on gel with this one) so be very, very careful removing the hairnet. I ended up carefully cutting the hair net off so as not to disturb the coiffure. She came out perfectly! And these are all taken with my quick point and shoot. Can’t wait to get her into the studio. 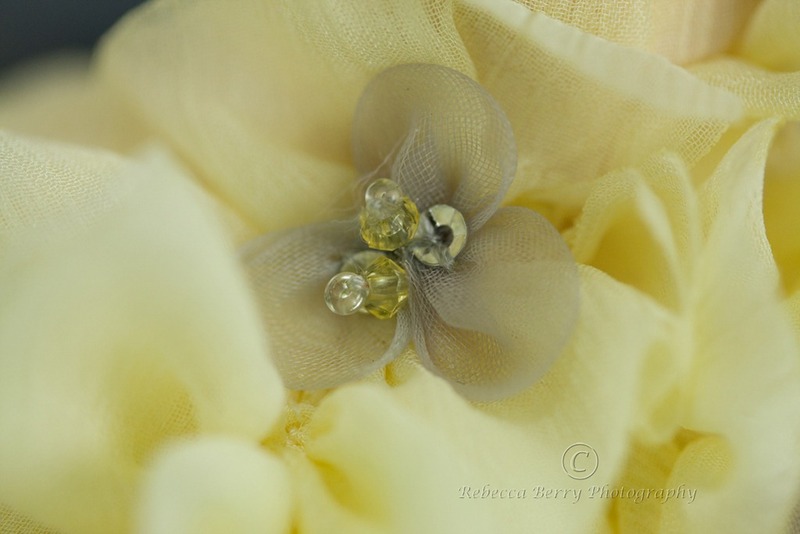 The BFMC 2013 Atelier Collection: A peek into next year? 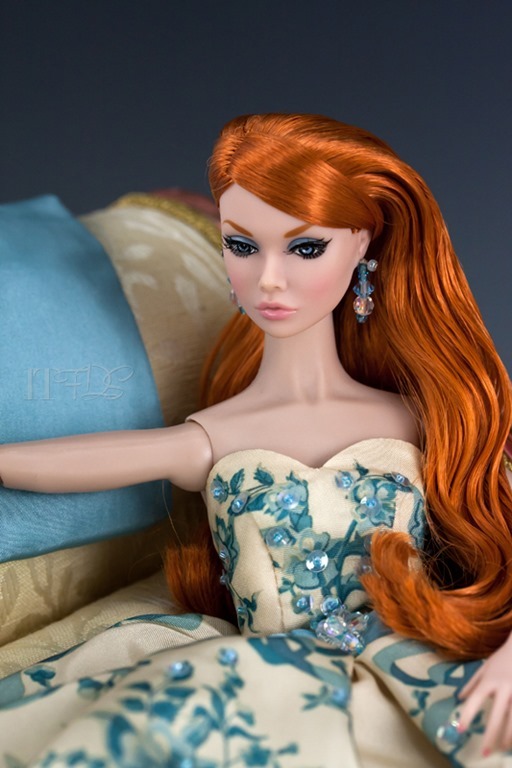 Okay…so you all know I am a little obsessive compulsive when it comes to Silkstone Barbies right? 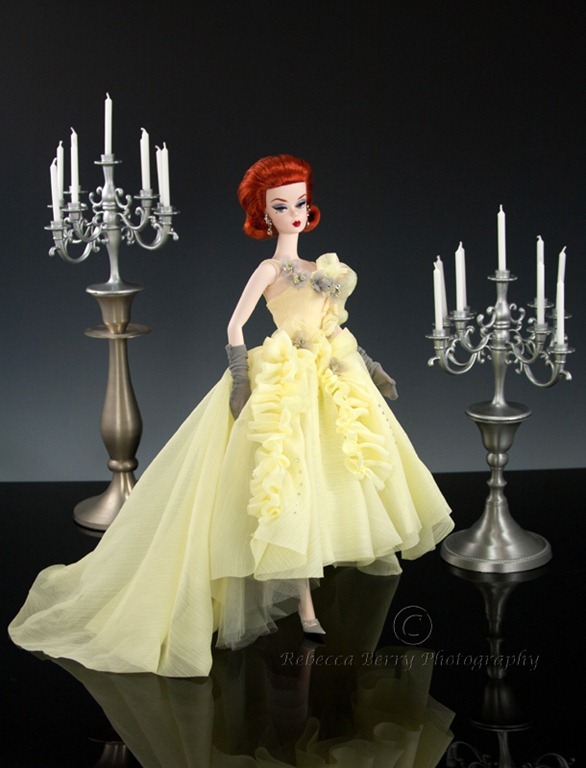 I was so excited when I learned that Robert Best was continuing the design aesthetics of the 1950’s and early 60’s for his 2013 BFMC collection. This was the “heyday” of the haute couture design houses and for many epitomized glamour. I absolutely adore that time in fashion so it stands to reason I am anxious to hear about and see sneaks with what we can expect next year. As I stated in my previous post, I believe we received a very solid sneak of one doll. It would appear that she will be blond, possibly platinum blond, with a back ponytail hairstyle. I can’t tell if she has bangs or not. To me, it kind of looks like “Movie Mixer” with black bows but I could be completely off on that one so don’t hold me to it. 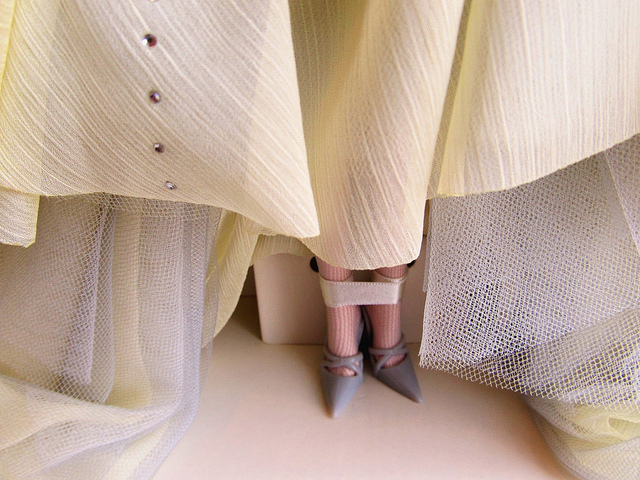 It would also appear that she has a cream boat necked cocktail gown with black tulle overlay and accent lace at the bottom. 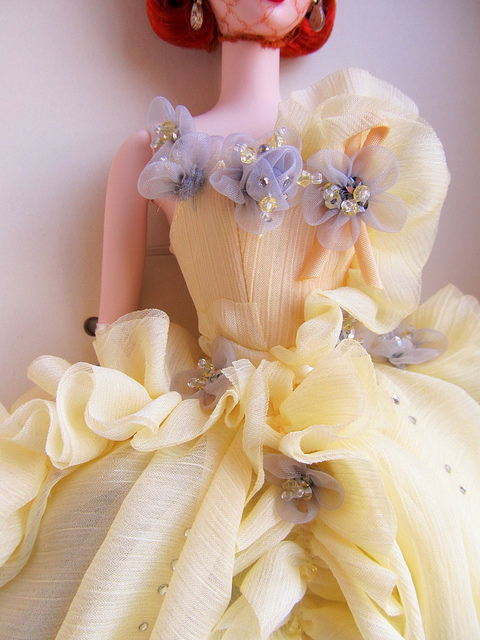 There is black bow detail at the bust and waist. It also looks like she is wearing white gloves.There was a most deliberate shot in the video of him working on this sketch and dipping his brush in water and releasing a light blue paint. There has to be some blue in this lady somewhere I am thinking ( blue bows?? blue accent somewhere). 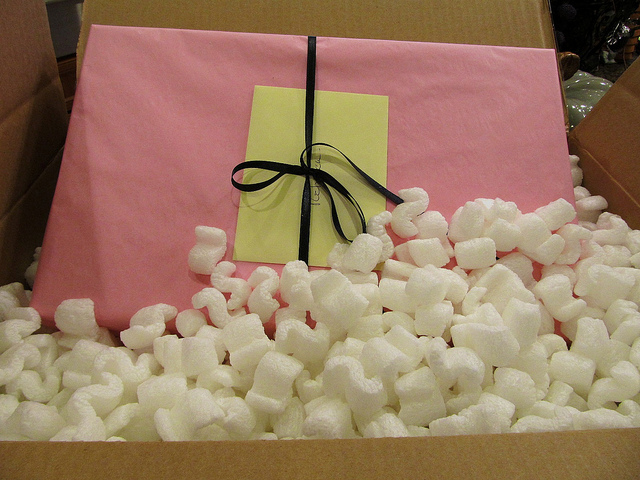 It looks like she will have bows on her black shoes as well…how cute!. Now….before I get going full force on my speculation train here folks…please realize these are all guesses. I have no information from Mattel save the video that we all can see so …take everything I say with a grain of salt. Disclaimer ended. We do know however, that Mr. Best’s designs for next year with have a flavor of Spring. He shared that at convention. So I am thinking lighter colors and softer fabrics. The other shot from the video that was intriguing me yesterday is this one…yes, I know it’s blurry but it was the best I could do. There was another scene right before this one that showed him removing a piece of fabric from a sketch of a doll in a dark colored ( blue maybe?) suit with hat. The sketch said specifically Atelier part II so I am thinking we may see another day suit with a hat. Yippee!! I will never be upset about more suits with hats. 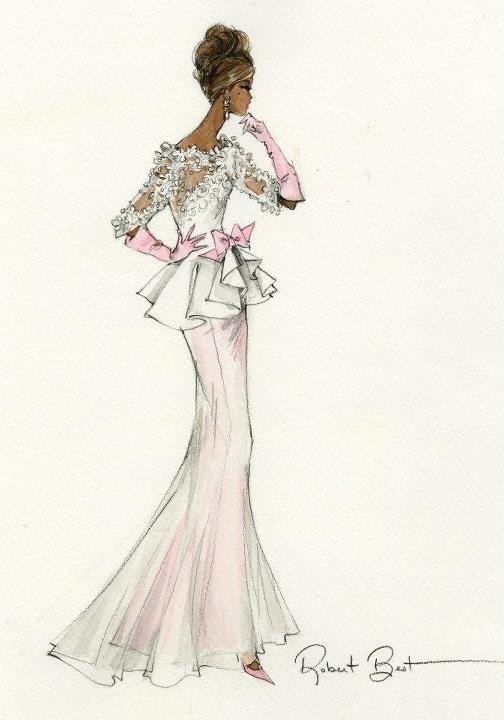 It also looks like there is a sketch with a redhead in a soft palette suit with pink/peachy turban style hat. Oh My Word!! My hat fetish just started doing the rhumba. There is also a sketch to the left there of what appears to be an evening gown with feathered type headpiece…kind of Gloria Swansonish. Again, I have no idea if any of these sketches will be produced but they are far enough along to have detail sketches and fabric swatches. I smell….production. 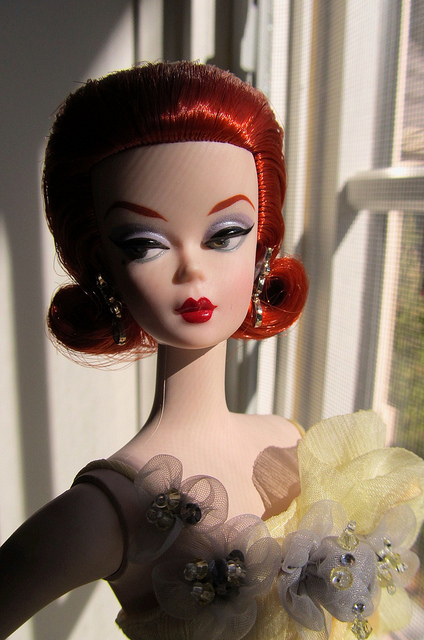 If you collect Barbie, you are no stranger to The BFMC. 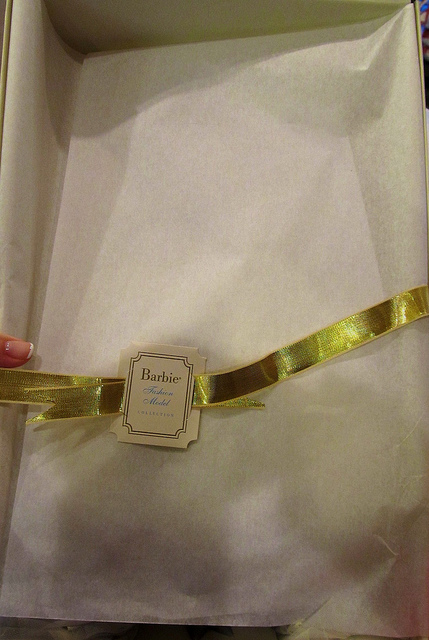 It stands for Barbie Fashion Model Collection. 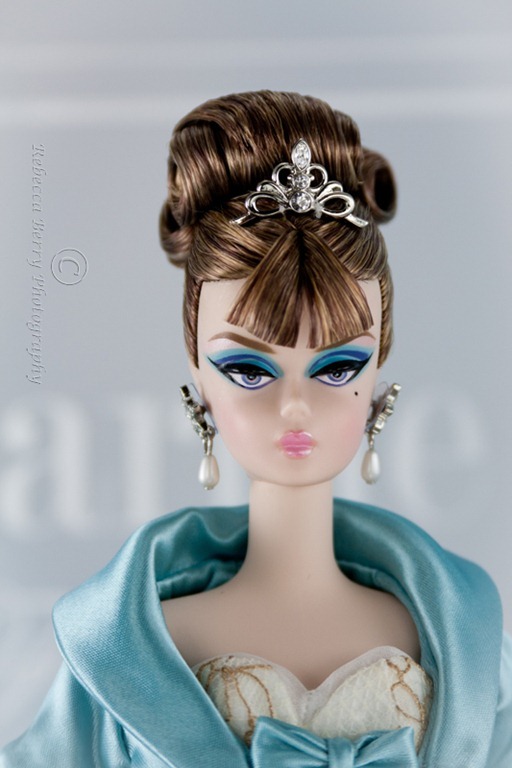 It basically means “Silkstone Barbie” . 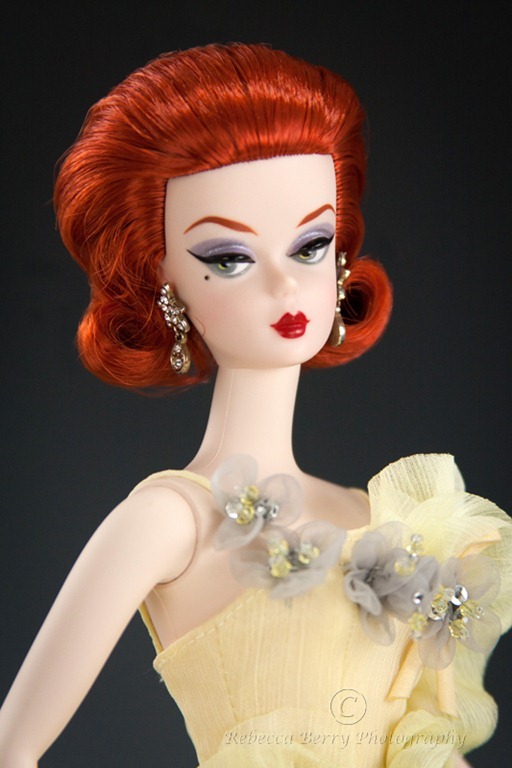 Robert Best is the designer for this line of dolls for Mattel and he has a talented crew of colleagues that are responsible for the photography, styling, set design and construction and video production of the glamourous photos and videos that promote and advertise these beautiful dolls. 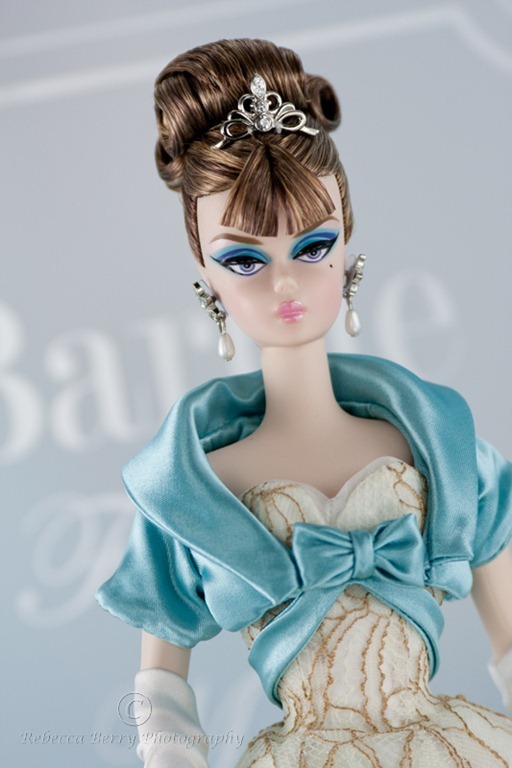 If you are a collector of Silkstone Barbies, you have seen and drooled ( yes drooled people…I have done it and am not afraid to admit it) over the photos of these lovely ladies. 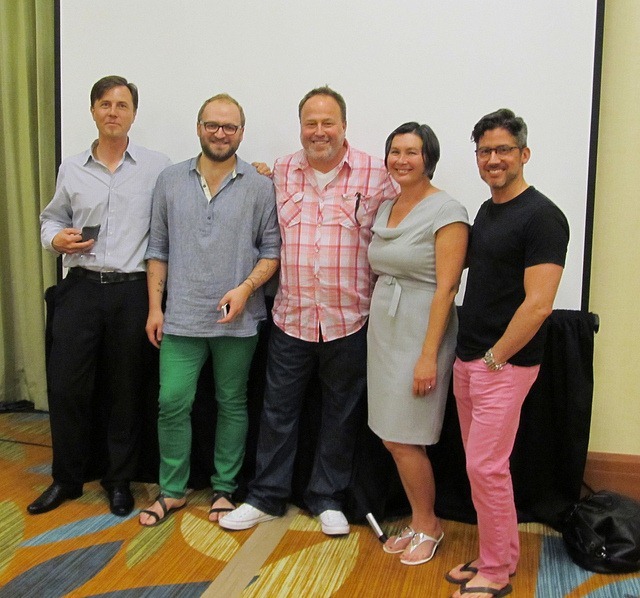 This year at convention, Mattel hosted a pullout session where Paul Jordan ( Photographer), Mary Jordan ( Stylist), Lars Auvinen ( Set Designer and Builder), and Zlatan Zukanovic ( Video Editor ) came to share their experiences working with this team. The session was very informative and what impressed me as an observer was the truly cohesive and respectful support and encouragement that they projected. We, as consumers, enjoy the product that they work on. I knew that. As a team, it would appear that they genuinely enjoy working with one another and each has an important and respected part to play in this world we call the BFMC. They were very free with their experiences and advice and even took the time to speak with a few of us who stayed after the session to ask questions. 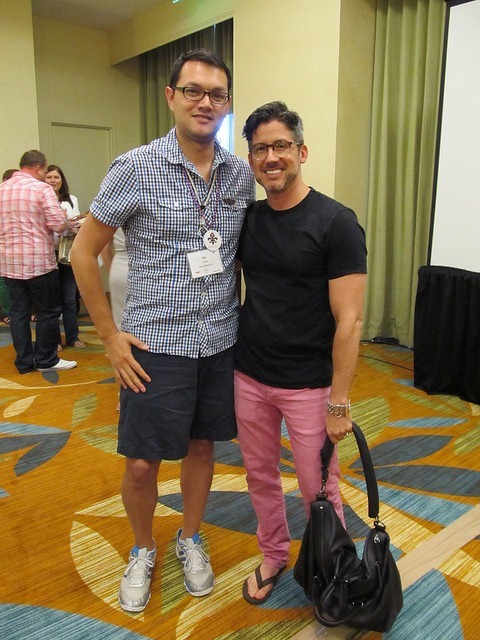 They were nice enough to share some tips and I look forward to using them Inside The Fashion Doll Studio. 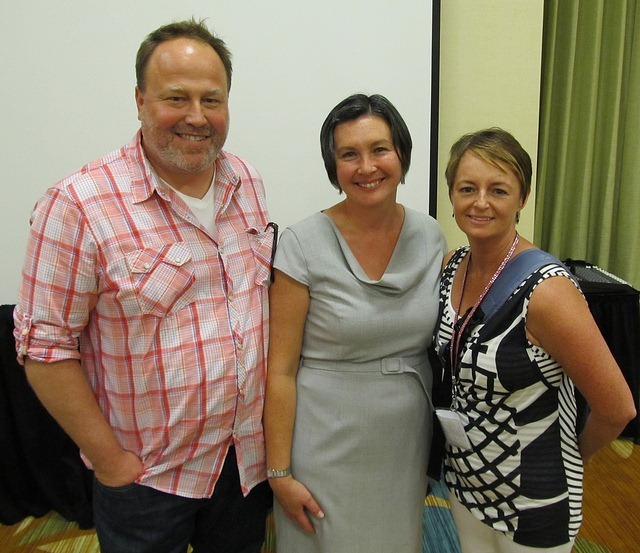 I think one of the people who I most wanted to hear from in this session was Mr. Auvinen. Much of his work is what is showcased in the fabulous behind the scenes videos( Thank you Mr. Zukanovic!!!!) that Mattel has given us over the past couple of years. Many of us marveled over the 1/6 scale carriage that was displayed in the William and Catherine photos and video. Mr. Auvinen shared his thought process and the research he goes in to when coming up with a sets for the BFMC photos. The historian in me rejoiced at the research and thought he puts in to each and every set. The photographer in me wanted to give him a big hug for his attention to detail and scale. He really researches and enjoys what he does people. It was a pleasure to get a look inside his world for just a moment as he explained the thought process behind the Atelier set. 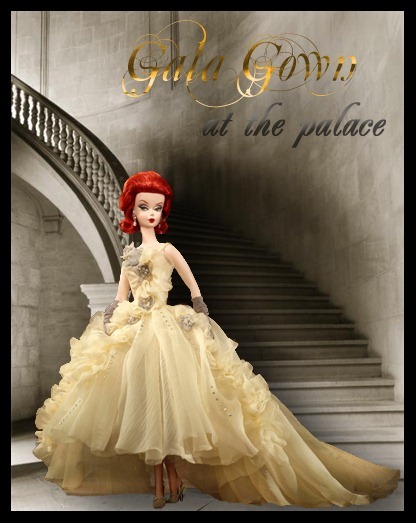 Time to put on your Party Dress….. I had a slight hiccup with this lady. 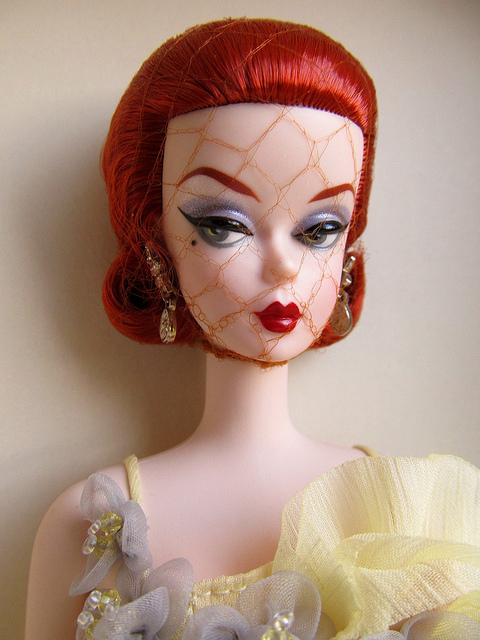 She came to me with some blue marks on her legs and I thought she would be going back to Mattel for an exchange. Turns out the marks rubbed right off with water so no problem. Once the marks were dealt with, I decided to shoot her in front of one of the fantastic acrylic display screens my friend Sheree makes. I use these in my doll displays and they work nicely in photos as well. Info on where to purchase is below. I love the hair on this lady and the cute little lace dress with aqua shrug is adorable. So refined and girly with the gold lace. 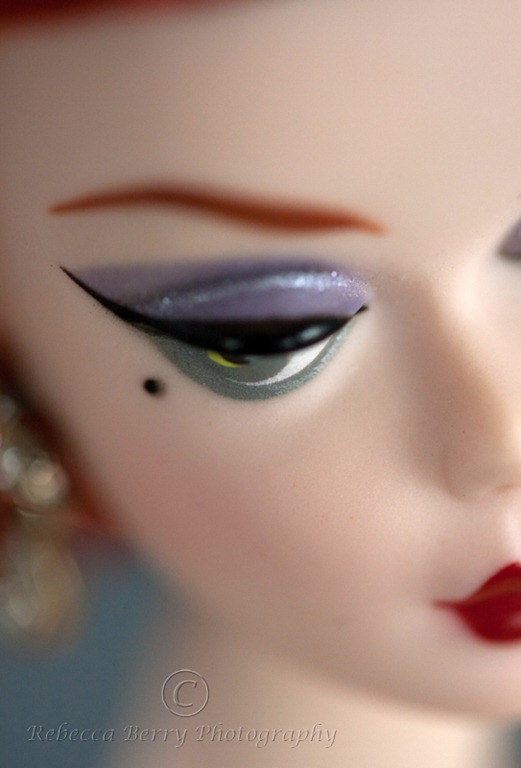 Here face makeup is quite dramatic as you will see with the close-up but I like it. I am still going over redress possibilities but those photos will be for another day. Just a side note, I did have to mess with her hair just a bit to get the curls to lie just right. I ended up putting a pin in one of them to get it to lie properly. On with current photos…. Set: Acrylic backdrop by Sheree http://www.ebay.com/sch/sh7ly7ma7/m.html?_nkw=&_armrs=1&_from=&_ipg=&_trksid=p3686. Chandelier is a locker chandelier by Locker Lookz. You can find them on Amazon. Elizabeth Taylor Silkstone photos released! I wrote about the Elizabeth Taylor celebrity Silkstone a couple of weeks ago and now we hear there will be not one but two Silkstone releases of Liz. 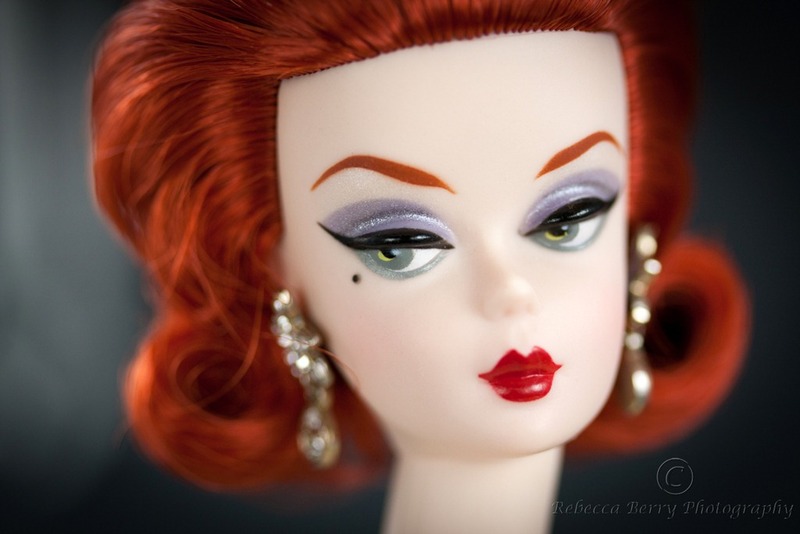 I was hoping for a “Cat on a Hot Tin Roof” inspired set with the little slip and….I got my wish!!! While the dress is not exactly a reproduction, it’s close enough and I will take it. It will be available in a giftset called White Diamonds. It will retail for around $150.00 and will be available in the fall. The second Elizabeth Taylor offering is stunning!! 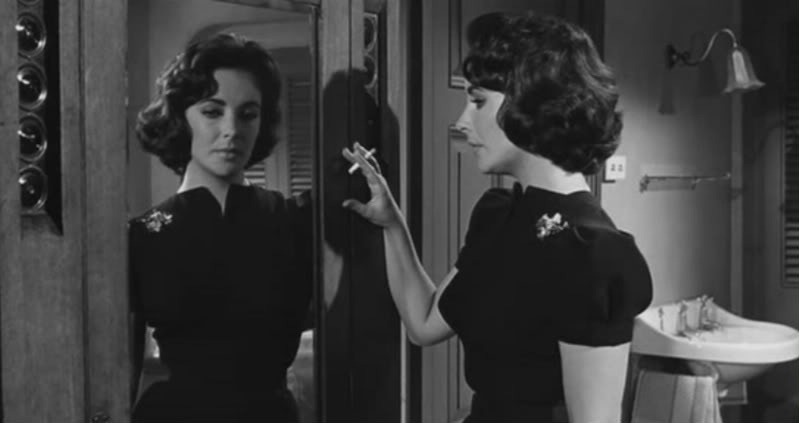 It features Ms. Taylor in a gorgeous black gown inspired , I believe, by the movie Suddenly, Last Summer. It’s called “Violet Eyes” and will retail for around $130.00 . It will be available in the fall.